The American Eagle Squadrons - Royal Observer Corps Association This website was set up in October 2012 and is the new official site for the Royal Observer Corps Association. At the start of World War Two, in November 1940, 244 American pilots crossed the Atlantic to volunteer as fighter pilots with the RAF and the RCAF. At that time the United States of America was a neutral country, and these men faced the possibility of losing their US Citizenship for taking part in a foreign war. 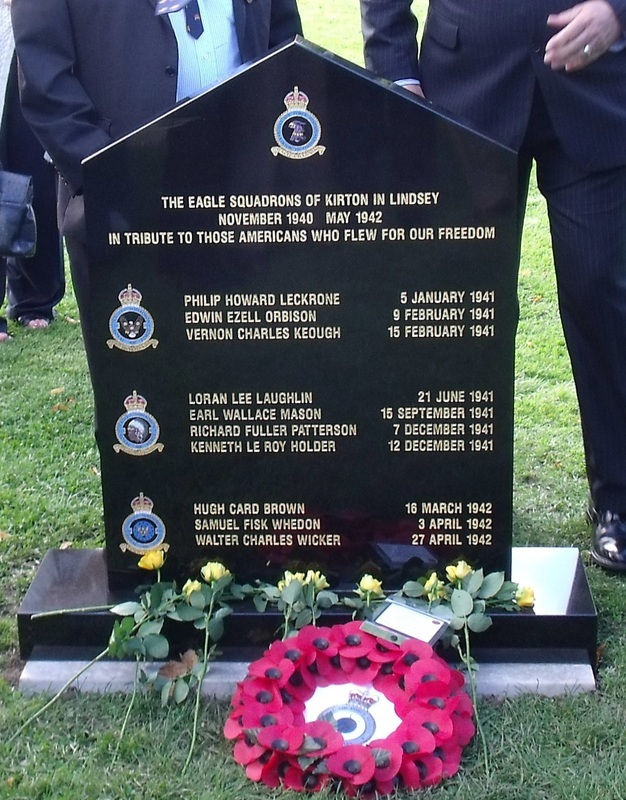 They were welcomed here by the RAF and flew together in three units that became known as "The Eagle Squadrons". These were 71, 121, and 133 Squadrons.Based at RAF Kirton in Lindsey, Lincolnshire where they gave a good account of themselves. Ten of these brave defiant young men lost their lives, fighting for freedom, in 1941 and 1942. Following America's entry into the War, the Eagle Squadrons were transferred, on the 29th of September 1942, to the US Air Force, and became the 334th, 3335th, and 336th Fighter squadrons. (These Eagle Squadrons still exist to this day, flying F18's out of Seymour Johnson Air Force Base in North Carolina). The sacrifice, of these ten American airmen, has never been recorded on any war memorial until now, some 70 years later, when a unique headstone was dedicated, close to the War Memorial in the Lincolnshire village where they served. 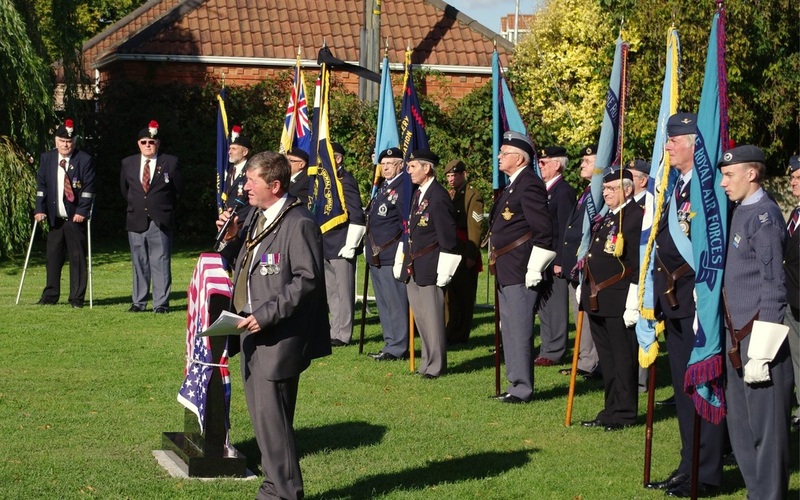 The Memorial Service was attended by the Mayor of Kirton in Lindsey, together with Civic Dignitaries, and representatives from the USA including Veterans from the US Air Force. 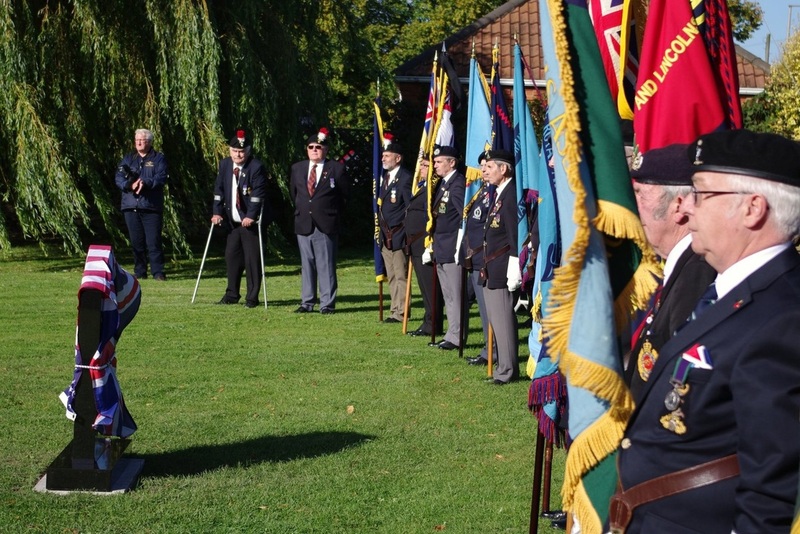 The unveiling took place following a parade of veterans and their standards, including the 15 Group ROCA standard carried by Bill Warwick. At a Civic Reception after the Service current Eagle squadron Historian from North Carolina, Dr. Roy Heidicker, presented the Town Mayor with a painting of the current Squadron's F18 aircraft, standing on a wet apron at their current base. If you look closely at the picture shown below, the artist has cleverly arranged the reflection of the F18, in the wet tarmac, to become an Eagle Squadron Spitfire of 1941. ROCA Participants at the Ceremony were:- 15 Group Chairman Peter Jex, and his wife Anne, Group Secretary Norman Hart, Group Standard Bearer Bill Warwick, Charles Parker, Michael Clements and Michael Marks. 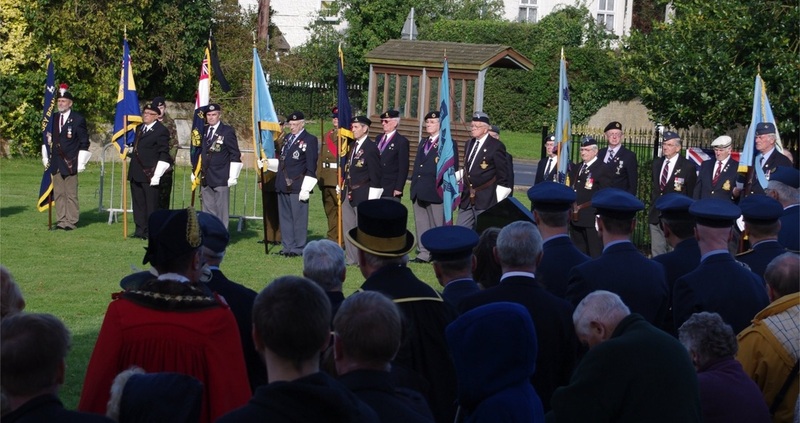 The Standards form up behind the Memorial draped in the Stars and Stripes and the Union Jack. Bill Warwick is standing six from the left. 15 Group Chairman Peter Jex is standing at the back, fourth from the right. 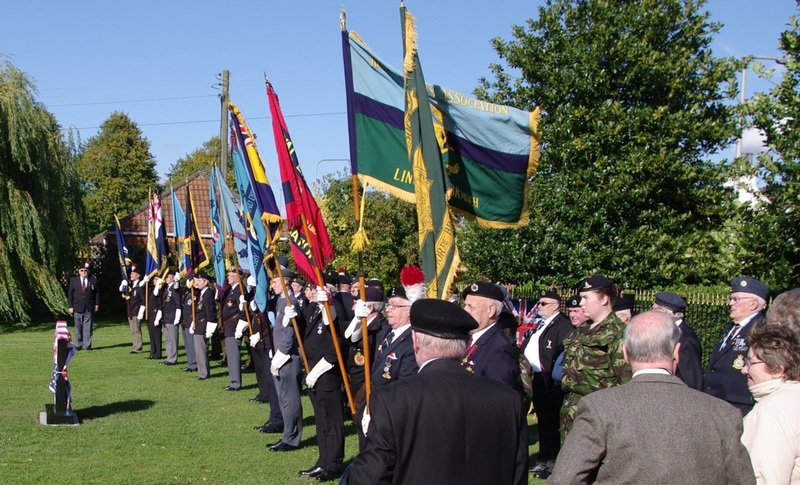 Lincoln Group Standard Bearer Bill Warwick is fourth from the left. The Memorial is unveiled showing the names of the ten fallen US Pilots. The yellow roses were laid by the local schoolchildren, who also read out poems they had written in tribute. 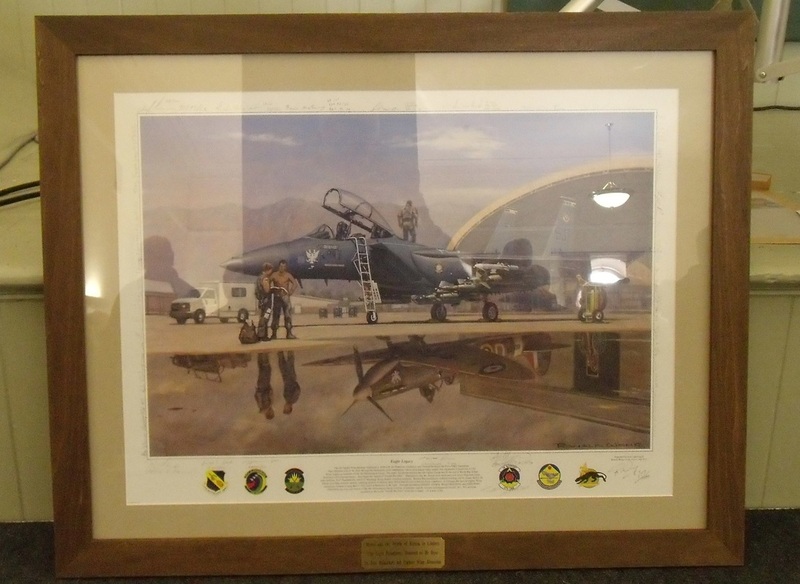 The painting, presented to the Village of Kirton in Lindsey, by the American Veterans, showing the current aircraft of the USAF Eagle Squadrons. Note the reflection of the RAF Spitfire in the wet tarmac.